The Stockholm Dialogue on the Nexus between Human Rights, Environmental Sustainability and Conflict Prevention took place in Stockholm on 12 June 2018. 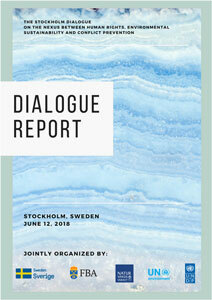 More than 100 participants from 26 countries joined the Stockholm Dialogue. They represented national governments, the UN, academia, civil society, and the private sector, with a special focus on countries with large mineral reserves, including Argentina, Colombia, Kenya, Mali, Mauritius, Mozambique, Peru, and Venezuela. The Dialogue participants shared their perspectives and experiences on how to improve the management of natural resources in ways that advance the 2030 Agenda for Sustainable Development and ensure more sustainable and peaceful results across countries and regions.